A new food pantry is set to open on campus next week, a local step toward addressing the food insecurity that college students face nationwide. The NMC Food Pantry operates out of the basement of the Osterlin Building and is available to all active students starting Nov. 1, said Paul Kolak, an NMC counselor and member of the pantry steering committee. Students won’t have to physically access the shelves, however. Instead, they’ll fill out an online form stating their household size and needs. Student volunteers will fulfill the orders anonymously, and recipients will be notified when their order is ready for pickup — hoped-for turnaround is 24 hours — at the Student Success Center, also in the Osterlin Building. “We’re just trying to be really discreet with it,” Kolak said, adding that the pantry will aim to feed people for about three days. “We’re not seeking to be a grocery store. This is a supplement,” he said. In August, a study released by the Urban Institute reported that 13 percent of community college students were “food insecure” in 2015. Food insecurity is defined as reduced quality of diet and access to nutrition. In a typical NMC class of 40, that 13 percent translates to five students. 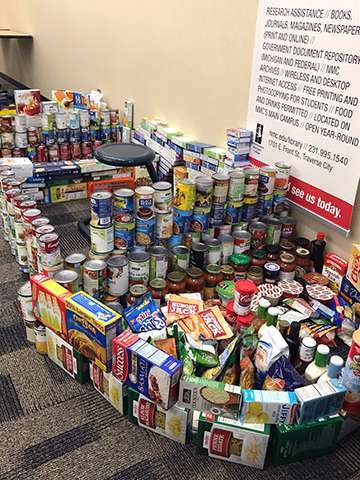 Consequently the NMC Food Pantry has dubbed all food drives the Minus Five project. The first was held Oct. 10 with faculty and staff donating during the annual Professional Development Day. The pantry will also be supplied by other sources, including the NMC Foundation, the Northwest Food Coalition, which supports several dozen regional pantries, and a Grand Rapids-area organization called Feeding America. Besides non-perishable food items it will also stock health and hygiene items such as soap, shampoo, toothbrushes and toothpaste. 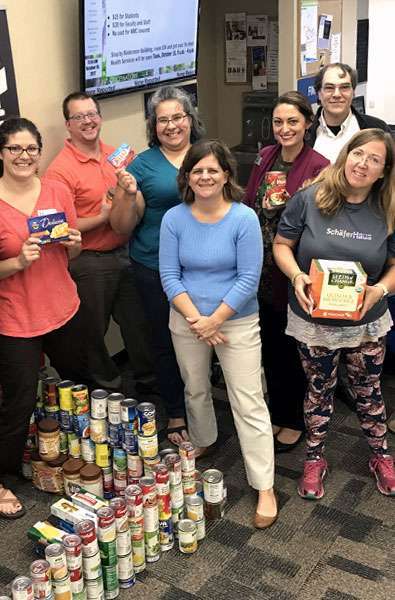 NMC business students have conducted a food drive as an experiential learning project for the last five fall semesters, and employees have donated food at the annual college holiday party. Now, both those efforts will help keep dignity and convenience right on campus. NMC students past and present are achieving success in the classroom and in their careers. This section showcases just a few examples. Forward this story to a friend!